We're a week into what has been an absolutely thrilling experience so far. What was more of an experiment to see what some developers might pull off with the new Beta release has far exceeded our expectations. 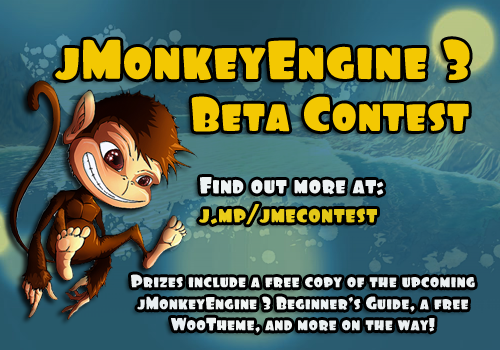 Prizes include a free copy of the upcoming "jMonkeyEngine 3 Beginner's Guide" and a free theme from the WooThemes shop. Additional prizes might be added. Even if you've never used jMonkeyEngine before, 1 and 1/2 months could be enough time to put a game together if you have some experience in Java programming and game development already. We highly encourage developers to download the jMonkeyEngine 3 SDK as the recommended route to a quick start. From there the wiki and community forum are mere clicks away. We hope this contest will bring some new blood into our lively community, and we trust you'll find it worth your while.